(ANSAmed) – ANKARA – The Christian world is alarmed over the possibility ventilated in local media that Turkish Islamic Premier Recep Tayyip Erdogan could convert Istanbul’s Hagia Sophia basilica, a symbol of Orthodox Christianity that is currently a museum, into a mosque in the coming months. Ecumenical Patriarch Bartholomew I reiterated his firm opposition to such a plan, Radikal newspaper and other media reported. ”We will oppose this, as will all Christians be they Orthodox, Catholic or Protestant”, he said at meeting with scholars on the eve of the Sinaxis, a summit of Orthodox churches kicking off Istanbul on Thursday. ”The Hagia Sophia basilica was built as a testament to Christian faith and if it is to be returned to a cult, it cannot be to any other than the Christian one”, AsiaNews cited the patriarch as saying. His government beset by a corruption scandal involving key figures in his Islamic regime, Erdogan might pin his hopes of recovering public approval on turning Hagia Sophia into a mosque on the anniversary of the 1453 Ottoman conquest of Constantinople, which falls in May, according to Radikal. The great Byzantine basilica became a mosque with the Ottoman conquest, and in 1934 was turned into a museum drawing millions of visitors a year by Mustafa Kemal Ataturk, who founded the modern secular Turkish Republic in 1923. Islamic groups in recent weeks have gone on the offensive to have Hagia Sophia turned back into a mosque, garnering authoritative names from the Turkish nomenklatura to champion their cause in what is a key electoral year for an embattled Erdogan, with administrative, presidential and legislative elections ahead. While Erdogan in the past called for everyone to ”leave Hagia Sophia alone”, the political climate has now changed. Turkey’s two remaining Hagia Sophia (Greek for Holy Wisdom) basilicas and museums, in the cities of Trabzon Nicaea, have in recent months been converted into mosques. 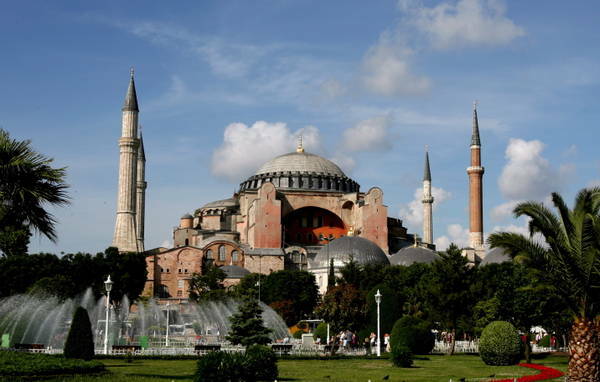 The Greek government recently added its voice against the growing pressure to convert Istanbul’s Hagia Sophia as well. (ANSAmed).